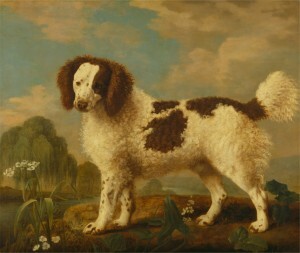 Brown and White Norfolk or Water Spaniel Date, 1778. By George Stubbs (1724-1806, British). Yale Center for British Art, Paul Mellon Collection. Scholars date both the beginnings of modern pet-keeping and modern discourses of animal rights to the eighteenth century. Here is just a small sampling of recent scholarly work on dogs in eighteenth-century life. how the literary works of the eighteenth century use animal-kind to bring abstract philosophical, ontological, and metaphysical questions into the realm of everyday experience, affording a uniquely flexible perspective on difference, hierarchy, intimacy, diversity, and transcendence. Writers of this first age of the rise of the animal in the modern literary imagination used their nonhuman characters—from the lapdogs of Alexander Pope and his contemporaries to the ill-mannered monkey of Frances Burney’s Evelina or the ape-like Yahoos of Jonathan Swift—to explore questions of human identity and self-definition, human love and the experience of intimacy, and human diversity and the boundaries of convention. Drawing on Parliamentary debates, print polemics, and satirical prints, this essay traces the rhetorical erosion of seemingly categorical distinctions between human and animal, animate and inanimate, person and thing, in the controversy that arose around the 1796 imposition of a tax on dogs. The passage of this seemingly slight piece of legislation created impassioned debates about the nature and welfare of animals, about the rights of individuals to possess or keep property, and about the way the kinship felt for animals tampers with the seemingly self-evident borders of kind. At a moment in which sentimental humanitarian concern with the rights and interests of animals had reached new heights, the taxation of dogs seemed to reclassify the animal as a thing and to draw into question the relation between humans and their ostensible best friends. Although proponents of the bill endeavor to proceed as if dogs can be considered on the same terms as other kinds of taxable luxuries (devouring resources that might better be devoted to humans), opponents of the tax focus on the bonds of mutual dependency and reciprocal obligation that tie humans and animals together, arguing that the right to keep a beloved entity such as a dog expresses a distinctively human need to keep something beyond mere, bare, necessity. Inasmuch as humanity is expressed and inheres in the relation people take to other creatures, the seeming superfluity of the dog embodies the essence of what allows, or enables, people to act as humans. The toy dog, a small but far from trivial commodity, mediated relations of racial, sexual, and species difference and helped establish a luxury market for the pet as a racialized fetish object that continues to this day. The Journal for Eighteenth-Century Studies, published by the British Society for Eighteenth-Century Studies, produced a Special Issue on “Animals in the Eighteenth Century” in December 2010. While the full contents are only available to members and institutional subscribers, anyone can read abstracts of the articles at the link above. Until the eighteenth century small dogs kept as pets were regarded with some disdain (hence the negative connotations of lap-dog) but they enjoyed luxuries their outdoor counterparts could only dream of. But from the mid-1700s compounds attesting to the dog as a favoured and nurtured pet begin to appear, and they multiply and flourish throughout the nineteenth and into the twentieth century. They include comforts like dog baskets (earliest in 1768 Catal. Household Furniture, ‘A dog-basket and cushion’), dog biscuits (specialized dog treats, from 1823), dog food, dog doctors (first recorded in 1771 Tobias Smollett’s novel Humphry Clinker, ‘A famous dog-doctor was sent for’), dog hospitals (from 1829), and dog soap (first use 1869). The first reference to the dog as ‘man’s best friend’ appears in 1841, at a time when dogs began to be sentimentalized, and to be seen as having, if not souls, then at least personalities and feelings (perhaps because the industrialized city no longer needed them as outdoor working or guard animals, while the rabies vaccination developed in the 1880s reduced the threat they posed). And someone has collected a vast array of eighteenth-century portraits of pets (many of them dogs) and their owners on Pinterest. This entry was posted in Miscellany and tagged animals, Art. Bookmark the permalink.